For the mashed potatoes, peel the potatoes and boil in salted water for 20-25 minutes until soft. In a saucepan gently warm the butter, buttermilk and milk (do not boil!) add salt, pepper. Finely grate the Parmesan. Set aside. Take the medallions from the packet and pat. If using a fillet, remove any visible silverskin and cut into medallions about 3-4 cm thick. Apply salt, pepper and thyme. Halve onions and cut into thin batons. Heat olive oil in a pan, fry the medallions in hot oil 3 minutes each side. Remove to rest. Add a little oil to the pan and sauté the onion. Drain potatoes, mash with the butter-milk mixture. 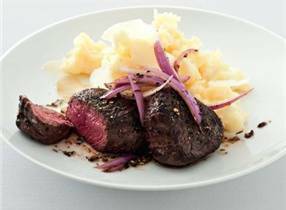 Serve with venison steak, onions and grated Parmesan.